Big, bold and beautiful, this concrete receptacle will withstand the most demanding conditions—helping keep facilities safe, clean and professional. The perfectly sized, 42 gallon trash receptacle is constructed with commercial grade precast concrete reinforced with steel rebar for added strength and stability. The self-closing push door lid keeps undesirable odors at bay, prevents the collection of precipitants and stops unwanted critters from gaining access. This lid is ideal for areas where food waste is collected in high volume, such as building exteriors, urban streetscapes and parks of any size. Made from polyethylene, the lid will not chip, dent, rust or corrode and can be wiped clean with simple soap and water. 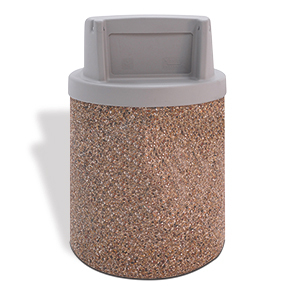 The stable concrete design and premium finishes of these round concrete receptacles will keep any property looking good for many years to come.